Printed in Greece. All rights reserved. Patroclus’ death time. We examined the solar eclipses within the time span 1400-1130 B.C. and we found that only the annular solar eclipse on 6th June 1218 yr B.C. 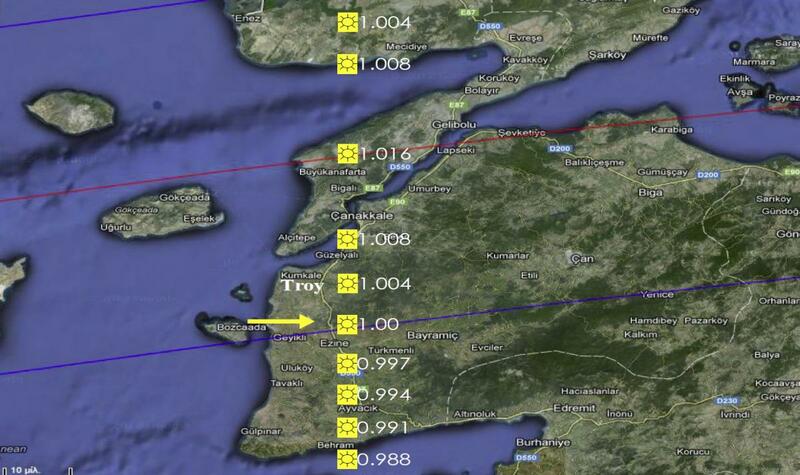 observable in Troy with significant obscuration 75.2 % fits fully with the Homeric descriptions. The Mycenaean civilization started within the 16th century B.C. peaked at the middle of 13th century B.C. and ended during a period of 50 years due to fires and seismic activity within 1130 yr B.C. The excavations have already discovered nine layers of the town of Troy. Archaeologists proposed various dates corresponding in the layers VI and VII as well VIIa or VIi correspond to the ΥΕ III Β 2 (Late Mycenaean B Age or Late Bronze Age) whether or not they accept the Trojan War’s reality (Table 1). Also, the ancient writers have given various dates of the Trojan War (see Table 2 in Papamarinopoulos et al (2012)). It is known that some astronomical events are described in the Homeric epics (Theodossiou et al., (2011)). Among them, a solar eclipse mentioned by Heraclitus of Pontus (Allegories, 75, 1, 1-9, 3), is described in the Odyssey during the suitors killing (Od. 20. 356-357). Schoch (1931), Papamarinopoulos (2008) and Baikouzis and Magnasco (2008) indicated that the so referred solar eclipse was a total one, that of the 16th April 1178 yr B.C. However, Papamarinopoulos et al (2012) studied the Homeric text’s details (climate, plants, fruits, agricultural and bucolic scenes, the long lasting nights, the constellations description etc.) and concluded that Odysseus’ arrival was autumn and not spring. The authors justified that the annular solar eclipse of the 30th October 1207 yr B.C. observable from the Ionian Islands as a partial one with significant obscuration of 75% is that mentioned by Homer. based on his own calculations, whereas in accordance with the NASA’s site Xavier Jubier “Five Millennium (-1999 to +3000) Canon of Solar Eclipses Database” the corresponding date of this solar eclipse is the 24th June 1312 yr B.C (Julian calendar). In this paper the above reference will be called NASA catalog (Stephenson and Houlden (1986), Stephenson and Morrison (1984), Stephenson (1997), Espenak and Meeus (2006) and (2009a, b, c), Morrison and Stephenson (2004)). However, Henriksson ignored to connect his proposed date with the solar eclipse’s date described in Odyssey after 10 years (because the Homeric epics clearly mention that Odysseus was absent for 20 years from Ithaca and the Trojan War duration was 10 years). Indeed, a solar eclipse of the 17th November of 1301 yr B.C. (based on NASA catalog) was visible in the Ionian Islands as a partial one with obscuration 46%. However, the timing was early in the morning (start at 6.53 LT, peak at 7:39 LT and end at 10.03 LT). It is not associated with the suitors killing time, at late noon. Moreover, the planet Venus was visible in the eastward direction five days before this solar eclipse in accordance with Homeric text (Od.13.93-95). On the contrary, planet Venus on the 12th of November 1301 yr B.C. was not visible in the east horizon because Venus rose at 8:31 LT, when sunrise was at 7:11 LT. Venus was visible in the westward direction and set at 18:24 LT whereas thesunset was at 17:42 LT, according to Starry Night 6 Pro Plus software calculations (2006). In other words no other solar eclipse has been found in the Ionian Islands ten years after the Trojan War’s end and the same being in accordance with the Homeric descriptions. (Papamarinopoulos et al., 2012 and references therein). Author’s name Layer* Years B.C. Dorpfeld W. (Zengel, 1990) Troy VI ca 1250 but after Kadesh’s battle. Nylander C. (1963) Troy VI Not historic Trojan War. Finley M. et al. (1964) – Not historic Trojan War. * The layers in Latin numbers illustrate the archaeologists’ stratigraphic differences in dating Homeric Troy. Furthermore, we examined fully the solar eclipses’ occurrence (partial, annular, total) based on NASA catalog; within the time span 1400-1130 yr B.C. We did not find another pair of so- lar eclipses, separated by ten years, which would be visible in Troy and in the Ionian Islands re- spectively satisfying fully all the Homeric de- scriptions, both in the Ionian Islands in the au- tumn (with Venus observable at eastward sky) and Troy’s environments within the spring and summer respectively. According to Papamarinopoulos et al (2012), Odysseus departed from Ithaca after the autumn equinox (4th October) of 1227 yr B.C. and he re- turned home after the autumn equinox of 1207 yr B.C., marking 20 years of absence. Conse- quently the first year of the Trojan War was 1227-1226 yr B.C. because battles were not con- ducted during the winter. The 10th year of the war was between spring equinoxes (1st April) of the years 1218 and 1217 yr B.C. respectively. More- over, we read in the Iliad (Il.2.134-138) that a wise man, called Calchas (Κάλχας) said that ‘so shall we fight nine years at Troy, but in the tenth shall take the town’. Also, Agamemnon in Il.2.134-138 said that ‘nine of Jove years are gone…’ and Odysseus said in Il.2.295-296 that ‘it is now nine long years that we have been kept here’. Consequently, we can say that the Iliad’s events happened at the beginning of the 10th year, in the spring and summer of 1218 yr B.C. Taking into account, all these analyses, we reached a new date for the Trojan War’s end based on the solar eclipse of the 6th June of 1218 yr B.C. visible in Troy. Henriksson (2012) mentioned that Alaksandu was Wilusa’s King in accordance with the Hittite archives as Starke (2001) published. Henriksson suggested that Wilusa’s ‘Alaksandu’ and Alex- ander (Paris) of Ilion, King Priam’s son, is one and the same person. However, Alaksandu was the successor of Wilusa’s King Kukunni (Kelder (2004/5)) and he is not mentioned by the Hittites’ archives as Priam’s son. The ‘Alaksandu treaty’, which was issued between Hattusa’s King Mu- watalli II and Wilusa’s King Alaksandu, is written in first singular person by the Hittite King him self. The text is as follows: ‘And when the country of Arzawa started war for one more time, and my grandfather, Suppiluliuma came and attacked the country of Arzawa, Kukuni the King of Wilusa had peaceful relations with him…’ (Beckman, Hittite Diplomatic texts, Atlan- ta 1999, page 82). Consequently, Alaksandu who is mentioned in the Hittite treaty, he had noth- ing to do with Alexander (Paris) mentioned by Homer. Also, Henriksson (2012) described a military operation in which Prince Pijamaradu was involved in 1315 yr B.C. He writes exactly: ‘It is known from Hittite texts that in 1315 yr B.C. Prince Pijamaradu …in military operations… After that, when Pijamaradu attacted the coast of Seha…the king of Wilusa, Alaksandu, was ordered by the Hittite king to send military help. …. But king Muwatalli II did not sent military help…’. However, in accordance with Henriksson’s way of thinking, in 1315 yr B.C. Troy’s King was Priam and not Alaksandu because Troy was sacked in 1312 yr B.C. We have noticed a disharmony in Henriksson’s data, between the simultaneous existence of the two Kings, Wilusa’s Alaksandu and Hattusa’s Muwatalli II in 1315 yr B.C., respectively, and Troy’s occupation in 1312 yr B.C. King in accordance with Homer’s text and the post-Homeric tradition. The annular solar eclipse of the 6th of June 1218 yr B.C. was visible as a partial one with significant obscuration over 75 % in Troy (Fig. 1). It occurred in Gemini constellation between planets Venus and Mercury. Its view was in NW direction between the well known in antiquity constellations of Ursa Major and Orion, eastward to Pleiades and Hyades clusters of Taurus constellation. The proposed by Henriksson (2012) total solar eclipse of the 11th of June 1312 yr B.C. (24th of June 1312 yr B.C. in NASA catalog), occurred near to Cancer constellation, eastwards from Gemini, and it is surrounded by the same constellations as that of the 6th of June 1218 yr B.C. (see Henriksson’s (2012), Fig. 2). According to the Homeric epic, Hephaestus built a new shield for Achilles decorated by nine scenes because the previous was taken by Hector when he killed his friend Patroclus. The last scene offered to the ‘Ocean’ and the first scene is described in Il.18.483-489: ‘΄Εν μεν γαίαν έτευξ’, εν δ’ ουρανόν, εν δε θάλασσαν,ηέλιόντ’ ακάμαντα σελήνην τε πλήθουσαν, εν δε τα τείρεα πάντα, τα τ’ ουρανός εστεφάνωται, Πληιάδας θ’ Υάδας τε, το τε σθένος Ωρίωνος Άρκτονθ’, ήν και Άμαξαν επίκλησιν καλέουσιν, ή τ’ αυτού στρέφεται και τ’ Ωρίωνα δοκεύει, οίη δ’ άμμορός εστι λοετρών Ωκεανοίο’. ‘Therein he wrought the earth, therein the heavens therein the sea, and the unwearied sun, and the moon at the mighty Orion, and the Bear, that men call also the Wain, that circleth ever in her place, and watcheth Orion, and alone hath no part in the baths of Ocean.’ In that, Hephaestus presents the world’s creation the Earth, the Sea, the Sky with the Sun, the Full Moon and many stars. From all these stars, he preferred to present the following well known constellations: The Pleiades and the Hyades which belong to the Taurus’ nebulae, the Orion and the Ursa Major (Bear). 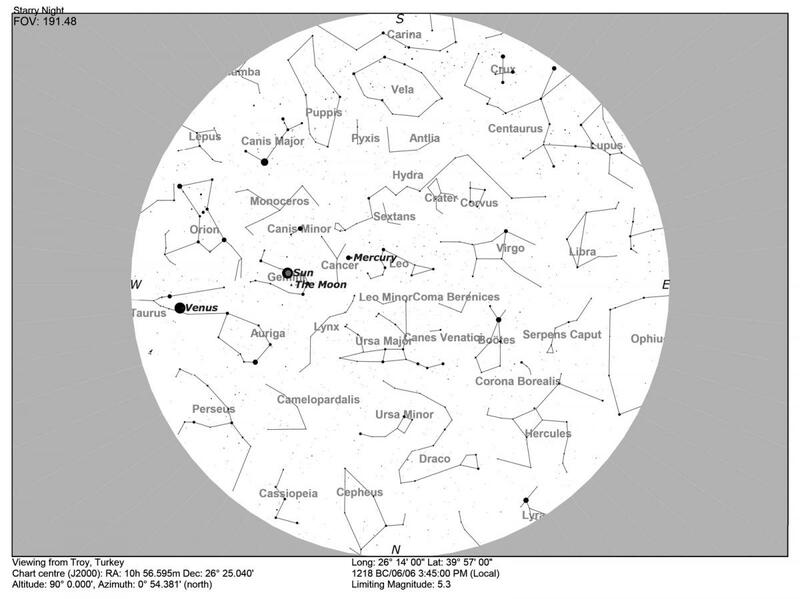 The latter is characterized as circumpolar constellation! We note that the constellations mentioned by Homer define peripherally the sky’s region in which the solar eclipse occurred with the most known and shining stars, in both cases of 1218 and of 1312 yr B.C. solar eclipses. The very first and the last from the thematic concentric scenes show where that shield was devoted: a) To Patroclus’ memory. It showed the sky view at the time of his death. His friend Achilles was holding always this shield in the battles. b) For gratitude to Thetis, Achilles’ mother, who helped, once, the builder of the shield, Hephaestus and protected him in the Ocean’s caves (Il.18.394-409). Figure 1. Troy’s sky (39° 57′ 0″ N, 26° 14′ 0″ E) at the maximum obscuration (75.2%) of the solar eclipse (13:45 UT or 15:45 LT) in the June of the 6th 1218 yr B.C. (JD 1276705) is shown. ΔΤ= 29356 sec. Limiting magnitude of visible stars and planets: 5.3, Sun altitude at maximum: 40ο, ΔΤ: ±1105 sec, ±4.6°. We examined Homer’s text in order to see if a new moon phase has occurred because it is an absolute necessity for the appearance of a solar eclipse. We also examined in which season, the facts in connection with the Iliad, are involved because both dates (Henriksson’s (2012) and ours in the current paper) indicate June. The night before Patroclus’ death, the Trojans were compelled to make many fires in order to watch better the Achaeans’ possible maneuvers (Il.8.500-511) because the night was black (‘νυκτί μελαίνῃ’). In Il.10.220-253, the Achaeans take advantage of the black night (‘νύκτα μέλαιναν’) and decide to send two spies towards the Trojans’ camp. Also, the Trojans thought alike in connection with the black night (‘νύκτα μέλαιναν’) and sent Dolon to spy the Achaeans (Il.10.357-395). Diomedes and Odysseus killed Dolon, they removed his weapons and placed them under a tamarisk bush in order to find them because of the black night (‘νύκτα μέλαιναν’). Also, in Il.10.275-277 indicated: ‘τοι δ’ ουκ ιδον οφθαλμοίσι νύκτα δι’ ορφναίην… and though they saw it not through the darkness of night…’. The above mentioned Homeric characteristic descriptions denote categorically a moonless night. It can be interpreted firstly either with the moon’s setting before the night comes or that is going to rise in the next day’s dawn and secondly there is a minute moon crescent near or in the phase of the new moon. Both cases lead to a dark night. If indeed the solar eclipse occurred, then the phase of the new moon is a rigid fact. summer solstice was on the 4th July of 1218 yr B.C. according to Starry Night program. Our proposed date on the 6th of June 1218 yr B.C. fits with the seasonal detail of an early summer’s warm day fully. of the 6th of June 1218 yr B.C. starting time was at 14.10 LT. This means that indeed a slight kind of darkness is occurred characterized, by Homer, as ‘night-νύκτα’ at noon and not ‘darkness’ as the interpreter translates. We note that this ‘night’ did not prevent the battle’s continuation. Patroclus tried four times to overtake the wall of Troy (Il.16.702-709). Also, from the sun’s behavior in Il.16.777-782, it is indicated that the time has been advanced toward late noon: ‘Όφρα μεν ηέλιος μέσον ουρανόν αμφιβεβήκει… πίπτε δε λαός ήμος δ’ Ηέλιος μετενίσετο βουλυτόν δε,…υπέρ αίσαν Αχαιοί φέρτεροι ήσαν. -Now as long as the sun bestrode mid-heaven, …and the folk kept falling; but when he turned to the time for the unyoking of oxen, …the Achaeans proved the better’. At that time, Patroclus was killed by Hector (Il.16.786-810). Zeus covered everything with thick darkness-‘ηέρα πολλήν’ (Il.17.269-270): ‘λαμπρήσιν κορύθεσσι Κρονίων ηέρα πολλήν χεύε-And the son of Cronos shed thick darkness over their bright helmets’. We note that Homer described a gradual increase in darkness during late noon. Indeed the solar eclipse of the 6th of June 1218 yr B.C. maximum obscuration (over 75%) occurred at 15.45 LT. After Sarpedon’s death, a destructive night (‘ολοήν νύκτα’) occurred. As the time advanced, after Patroclus’death, the destructive night became much darker (‘ηέρα πολλήν’), which is translated by interpreter as thick darkness. It is a very careful and detailed description of a progressing partial solar eclipse. It is well known that an absolute darkness is exhibited when a total solar eclipse occurs. However, the latter did not occur because the battle continued. In other words the increasing darkness never reached its maximum. you say that sun or moon still remained intact, for with darkness were shrouded in the fight all the chief men who stood around the slain son of Menoetius. But the rest of the Trojans and the well-greaved Achaeans fought unimpeded under clear air, and over them was spread the piercing brightness of the sun, and on all the earth and the mountains was no cloud seen; and they fought resting themselves at times, avoiding one another’s shafts laden with groans, and standing far apart. a) There is a clear reference of the solar eclipse in connection with the sun’s and the moon’s existence. It looks strange to be able to see in a late hot noon with ample sun light both, the sun and the moon in the sky! The only case which would allow the co-existence of these two bodies is the case of a partial solar eclipse. In reality the moon’s shadow would have covered partially the sun’s disk. If the solar eclipse was total, the moon could not be seen at all because the two heavenly bodies would be placed one upon the other. In reality the moon’s shadow would have covered all the sun’s disk. b) The men who were fighting around Patroclus’ body were occupied by the ‘ηέρι μάχη’-‘with darkness’. The interpreter did not realize the subtle difference between the single word ‘ηέρι’ and the same word combined with the word ‘battle’ as ‘ηέρι μάχη’. We note that the passage says the following: ‘ηέρι γαρ κατέχοντο μάχης επί δ’ όσσον άριστοι’- “for with darkness of the battle were shrouded in the fight all the chief men”. Consequently this means a synecdoche, the mayhem, the dense dust of the mist of the battle and not a ‘remarkable darkness’ during day light itself. c) The passage continues as follows: ‘but the rest of the Trojans and the well-greaved Achaeans fought unimpeded under clear air, and over them was spread the piercing brightness of the sun and on all the earth and the mountains was no cloud seen’. The latter condition is given deliberately by Homer in order to explain that the gradual darkness mentioned in previous passages is not due to the clouds. The piercing sun light is emanated intensively from the sun’s remaining uncovered part. Homer described with exceptional clarity a partial solar eclipse. We offer to the reader a real example of what a partial solar eclipse with 75% obscuration produces both in the sky and in the ground (Fig. 2). The piercing sun light in a cloudless sky together with the impressive darkness on the ground can be seen and consequently understood. Patroclus’ body, is located only in the middle of both armies. Furthermore, in the passage Il.6.1-4 is mentioned that the battle was taking place ‘μεσσηγύς Σιμόεντος ιδέ Ξάνθοιο ροάων.- between the Simois and the streams of Xanthus’. This region is north of the southern limit of totality’s zone as Henriksson (2012) has plotted in his own Fig.1. Consequently it is impossible for ‘some’ soldiers to fight and being located out of the zone of totality. In addition, it is well known that if an observer is just out of the zone of totality, he can observe a solar eclipse, as a partial one, with significant obscuration (p) of 99-98%. The light’s intensity just outside of this zone, which has a width of 250-300 km, is only ~1% of its nominal value according to L/Lmax=1-p (Mollmann and Vollmer (2006)), where L is the Sun’s illuminance corresponding to p (the obscuration of the solar disk) and Lmax is the Sun’s Illuminance. In Fig. 3, we can see that in the eclipse proposed by Henriksson’s date, the solar disk’s obscuration varies from 100 up to 99% in NW Turkey. The sun’s set is still far away from the time of Patroclus’ death because in Il.17.455 the time of the events is mentioned by Homer allowing Hector to say ‘εις ό…δύῃ τ’ ηέλιος και επί κνέφας ιερόν έλθῃ’- until…and the sun sets and holy darkness comes on’. However, Ajax saying in Il.17.643-647: ‘αλλ’ ου πῃ δύναμαι ιδέειν τοιούτον Αχαιών· ηέρι γαρ κατέχονται ομώς αυτοί τε και ίπποι. Ζευ πάτερ αλλά συ ρύσαι υπ’ ηέρος υίας Αχαιών, ποίησον δε αίθρην, δος δε οφθαλμοίσιν ιδέσθαι· εν δε φάει και όλεσσον, επεί νυ τοι εύαδεν ούτως-Howbeit, nowhere can I see such a one among the Achaeans, for in darkness are they all enwrapped, themselves and their horses withal. Father Zeus, deliver thou from the darkness the sons of the Achaeans, and make clear sky, and grant us to see with our eyes. In the light do thou e’en slay us, seeing such is thy good pleasure’. This deep darkness can be explained because a lurid cloud came from the sky and landed among the fighting men in the battlefield as described in Il.17.548-552: ‘Ζευς εξ ουρανόθεν ……ως η πορφυρέῃ νεφέλῃ πυκάσασα έ αυτήν δύσετ’ Αχαιών έθνος, έγειρε δε φώτα έκαστον.-Zeus stretches forth for mortals …enwrapping herself in a lurid cloud, entered the throng of the Danaans, and urged on each man’. This cloud, which is red (πορφυρέη) was added on the mist of the battle (‘ηέρι μάχης’) and on the darkness (‘ηέρα πολλήν χεύε Κρονίων’) of the solar eclipse resulting in zero visibility for every fighter in the field. This obvious darkness resulted from both phenomena; the partial solar eclipse with significant obscuration of ¾ of the solar disc and the semi-transparent red cloud which appeared in front of the sun. This double condition from one hand allowed observers to see it and from the other hand caused the battle to stop, as mentioned by Homer. Figure 2: A partial solar eclipse with obscuration 75%. (Left): Il.17.366-376 ‘πέπτατο δ’ αυγή ηελίου οξεία, νέφος δ’ ου φαίνετο πάσης γαίης ουδ’ ορέων’-‘the piercing brightness of the sun, and on all the earth and the mountains was no cloud seen’) and Il.17.269-270 ‘ηέρα πολλήν χεύ’-‘shed thick darkness’ The ‘piercing sun light’ in a cloudless sky is present in spite of the impressive imposed darkness on the ground by the partial solar eclipse. This is exactly what Homer described. (Right): Τhe moon’s shadow has covered only partly the sun’s disk. Consequently in any non astronomer observer’s view seem to be that the two bodies, the moon and sun coexist closeby. (After, Dr. K. Gazeas. Date: 1 August 2008. Location: Gobi-Altai Desert, Mongolia). Figure 3. Troy’s area. The central line depicts the central path of the total eclipse on the 24th of June 1312 yr B.C. reaching the maximum magnitude (http://eclipse.gsfc.nasa.gov). The symmetric lines, with respect the central, are totality’s northern and southern limits respectively. The longitude is the same for all positions. The arrow to the south of the totality’s southern limit shows a region in which Herrinkson (2012) sets a part of the fighting armies. Ajax requested from Zeus to allow the light to come again and die in the light. Zeus “responded” in Ajax’s request, as described in Il.17.649-650: ‘αυτίκα ηέρα μεν σκέδασεν και άπωσεν ομίχλην, ηέλιος δ’ επέλαμψε, μάχη δε επί πάσα φαάνθη-And forthwith scattered the darkness and drove away the mist, and the sun shone forth upon them and all the battle was made plain to view’. The word ‘αυτίκα’-‘immediately’ is compatible with the timing of the solar eclipse’s maximum which is always last only few minutes. Zeus ‘removed’ two phenomena: a) He drove away the mist and b) made the sun to shine again. The latter is justified because the verb ‘επέλαμψε’ means ‘re-shone’, which shows literally that the sun’s light has vanished, due to the eclipse, and then ‘shone again’. This solar eclipse’ maximum occurrence happened at 15.45 LT and the eclipse ended at 17.07 LT, while the sunset was taken place at 19.25 LT (Starry Night program). Achilles stay near the camp’s wall, in order the Trojans to see him and to be scared (Il.18. 197-201). This means that during that scene the sun light still existed. Additionally in Il.18.241 (‘ηέλιος μεν έδυ’-‘so the sun set’) the sunset comes after the above described scene. This denotes full compatibility between the progress of the solar eclipse and the sunset. There is a unique pair of solar eclipses which are described in the Homeric Epics exhibiting a ten years time span between them. We examined the solar eclipses for the time period from 1400 to 1130 years B.C. taking into account that battles were not conducted in the winter. We also took into account the battles’ specific warm conditions in the Iliad and the autumn conditions in Odysseus’ return, respectively, as described by Homer analytically. Within both those corresponding, conditions mentioned above, the planet Venus was in the east sky before sunrise a) five days before Odysseus’ arrival and b) three days after Patroclus death’s day. We found only one pair of two solar eclipses which satisfies fully the Homeric text: a) the annular solar eclipse on the 6th of June 1218 yr B.C. for the Trojan War’s end and b) the annular solar eclipse on the 30th of October 1207 yr B.C. for Odysseus’ return, observed as partial solar eclipses in Troy and the Ionian Islands respectively, with almost the same significant obscuration of 75%. To Dr. K. Gazeas, Lecturer of Astrophysics, of the University of Athens for his kindness to offer the astronomical photographs which will facilitate the non astronomer readers to visualize what Homer described. To the anonymous reviewer for his in depth constructive criticism. This paper is devoted to the Academician Professor Christos Zerefos of the University of Athens. Apollodorus (1921) The Library, with an English Translation by Sir James George Frazer, F.B.A., F.R.S. in 2 Volumes. Cambridge, MA, Harvard University Press; London, William Heinemman Ltd.
Baikouzis C., Magnasco M.O., (2008) “Is an eclipse described in the Odyssey?”, Proc. Natl. Acad. Sci. U.S.A., vol. 105(26), 8823-8828. Beckman G. (1999) Hittite Diplomatic Texts, Atlanta. Espenak F., Meeus J. (2006) Five Millennium Canon of Solar Eclipses: -1999 to +3000, NASA Technical Publication TP-2006-214141. Espenak F., Meeus J. (2009a) Five Millennium Canon of Lunar Eclipses: -1999 to +3000, NASA Technical Publication TP-2009-214172. Espenak F., Meeus J. (2009b) Five Millennium Catalog of Lunar Eclipses: -1999 to +3000, NASA Technical Publication TP-2009-214173. Espenak F., Meeus J. (2009c) Five Millennium Catalog of Solar Eclipses: -1999 to +3000, NASA Technical Publication TP-2009-214174. Cedrenus G. (1889) Compendium Historiarum, 1, 228, J.P.Migne, Patrologia Graeca, vol. 121, Paris. Henriksson G., (2012) The Trojan War dated by two solar eclipses, Mediterranean Arhaeology and Archaeometry, vol. 12(1), 63-76. Heraclitus of Pontus (1962) Allégories d’Homère, Les Belles Lettres, Paris. Homer (1924) The Iliad, translated by Murray A T., Loeb Classical Library, Cambridge, MA, Harvard University Press; London, William Heinemann Ltd.
Howatson, M.C. (1996) The Oxford Companion to Classical Literature, s.v. Paris. John Malalas (2006) Chronicle, translated by Brian Croke, Elizabeth Jeffreys, Michael Jeffreys, Roger Scott et al., Sydney. Kelder Jorrit M., (2004/5) “Mycenaeans in Western Anatolia”, Talanta 36-37, 49-86. Mollmann K.-P., Vollmer M. (2006) “Measurements and predictions of the illuminance during a solar eclipse”, Eur. J. Phys., 27, 1299-1314. Morrison, L.V., Stephenson, F.R. (2004) Historical values of the Earth’s clock error Delta T and the calculation of eclipses. Journal for the History of Astronomy, vol. 35(3), No. 120, 327-336. Papamarinopoulos, St.P. (2008) “A comet during the Trojan War?”, Science and Technology in Homeric Epics, Paipetis S.A. (Ed. ), Springer Science, pp. 341-356. Papamarinopoulos St.P., Preka-Papadema P., Antonopoulos P., Mitropetrou H., Tsironi A., Mitropetros P., (2012) A new astronomical dating of Odysseus’ return to Ithaca, Mediterranean Arhaeology and Archaeometry, vol. 12(1), 117-128. Schoch, C. (1931) Die säkulare Accelaration des Mondes und der Sonne, Astronomische Abhandlungen, Ergänzungshefte zu den Astronomischen Nachrichten, Band 8, B2, Kiel. Starke, F. (2001) Troia im Machtfüge des zweiten Jahrtausends vor Christus, Die Geschichte des Landes Wilusa, Troia, Traum und Wirklichkeit, Konrad Theiss Verlag GmbH., Stuttgart. Starry Night User’s Guide (2006) Imaginova Corp. Toronto, Canada. Stephenson F.R., Morrison L.V. (1984) Long-term changes in the rotation of the Earth: 700 B.C, to A.D. 1980. Philosophical Transactions of the Royal Society. Vol. A313,pp. 47-70. Stephenson F.R., Houlden M.A. (1986) Atlas of historical eclipse maps: East Asia 1500 BC – AD 1900, Cambridge University Press, Cambridge. Stephenson, F.R. (1997) Historical Eclipses and Earth’s Rotation, Cambridge University Press, Cambridge. Theodosiou E., Manimanis V.N., Mantarakis P., Dimitrijevic M.S., (2011) Astronomy and Constellations in the Iliad and Odyssey, Journal of Astronomical History and Heritage, 14/1. Vougioukalou M., (2009) Αποκατάσταση Υγροτόπων: Μελέτη για την αποκατάσταση ενδιαιτημάτων της ορνιθοπανίδας για τη Χορταρόλιμνη Λήμνου, MS.c Aegean University, Greece, (in Greek).